The classic demonstration of the tornado in the bottle is to connect two bottles head to head with a special adaptor. The problem is that not everyone has one of those at home (you either have to order one from a teacher resource magazine or find one at the hardware store). 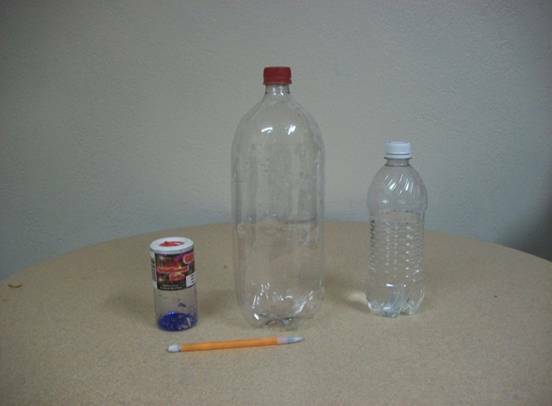 Well, here is a simple way that you can make a tornado in a bottle, with a few simple materials, at home. What you need: Clear plastic soda bottle (12 oz to 1 L in size); dishwashing liquid; glitter; a pencil; water. What to do: Add a couple of drops of dishwashing liquid into the bottle (a few more for a larger bottle). Slowly (to avoid making a lot of bubbles), add water down the sides of the bottle to fill it. Leave a little space at the top. Dip the tip of your pencil in water, and then use the wet pencil tip to pick up some of the glitter. Dip the pencil with the glitter into the bottle to release it into the mixture. Cap the bottle tightly. Give the bottle an abrupt circular swirl. Repeat as necessary to create a vortex (“tornado”). The glitter will make the vortex more easily visible. How did it work? When you rotate the bottle, the water in the bottle starts rotating, as well. The rotating water creates a centripetal force which pulls it toward the center of the bottle. At the same time, gravity pulls the water down. The result is a vortex, which is larger at the top, because of the space at the top of the bottle, and smaller at the bottom, because gravity is pulling the water down to counteract the vortex. The dishwashing liquid (a surfactant) helps suspend the glitter. Thanks to Tijani Osumah for contributing this activity. It is probably best suited for grades K-5, but let’s face it, making a vortex generator is fun for everyone. Here’s a YouTube video that also shows how to make and carry out this activity. Enjoy!